Time for Pedroia to call Ellsbury? In the first game of the season, second baseman Dustin Pedroia injured his thumb. An injury that could have ended his season if he had opted for surgery. But Pedroia played 160 games this season, then all 16 games this postseason. 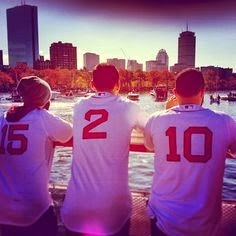 It is safe to say that without Pedroia the Red Sox would not have had the success that they had this year, and they would not have been World Champions. This was almost the case too. Early after the injury Pedroia was set on getting surgery to repair his thumb, he had mentally prepared and had watched games from the dugout. It all changed one day when the team had the day off. Pedroia went to the doctors and officially found out that had torn ligaments in his thumb. When returning home Jacoby Ellsbury asked him over text message if he was okay. Pedroia informed Ellsbury what he had learned earlier in the day, that his thumb was injured. Ellsbury then sent what may have been the most important test of the whole season "Is there any way you can play through it? We need you." This motivated Pedroia to continue to play and helped the team win the World Series. It is now time for Pedroia to return the favor and pick up the phone and text Ellsbury. The text that said "We need you" meant so much to Pedroia, it could mean just as much to Ellsbury. Ellsbury is wanted in Seattle, it is likely a large factor in him wanting to possibly sign with them. The Red Sox need to show Ellsbury that he is wanted, they need to make sure that Ellsbury knows that they want him to be the center fielder for the next 5 years. It is time for Pedroia to return the motivational favor, and make red sox nation rejoice. What do you think about Ellsbury? Is he gone already, will he give no actual thought to return to the Red Sox? Could Pedroia convince Ellsbury to return to Boston next season? Leave your answers in the comments section below or let me know on twitter.